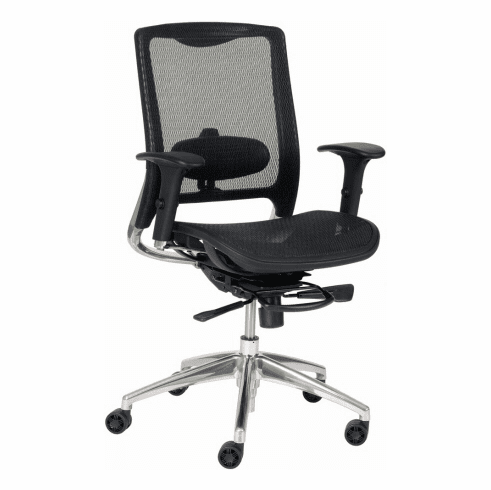 This ergonomic full mesh office chair from Ergocraft features multiple comfort and support adjustments along with a screen mesh seat and backrest for maximum comfort and ventilation. Other features include built in adjustable lumbar support, polished aluminum backrest frame, height adjustable arms with chrome accents, seat slider for seat depth adjustment, synchro-tilt control with anti-recoil feature, tilt tension adjustment, pneumatic seat height adjustment, 360 degree swivel and a polished aluminum base with stylish spoked casters. Optional adjustable mesh headrest also available for this model. Meets or exceeds ANSI/BIFMA standards. Dimensions: Seat Size: 19.6"W x 20 - 21.5"D. Back Size: 18.6"W x 22"H. Seat Height Adjustment: 19.5" - 23"H. Weight: 50 lbs. Overall: 38.25" - 41.75"H x 26"W x 26"D. 12 year limited warranty from Ergocraft. This chair normally ships within 5-6 business days from our CA warehouse.